Eritrea has said it will not retaliate after Ethiopia's cross-border raid on Thursday, easing fears of a new conflict between the long-time rivals. "Those who rush to aggression are those who do not know what the life of people means," Eritrean Information Minister Ali Abdu told the BBC. 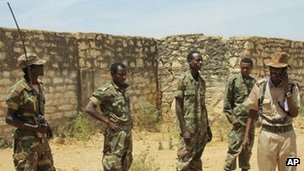 Ethiopia said it attacked three military bases where rebel groups were being trained. But Mr Ali accused the US of being behind the Ethiopian raid. "Not only this attack, the destabalisation of our region is instigated and compounded by the US," he told the BBC's Focus on Africa programme. Ethiopia, a close US ally, has also sent forces into Somalia to tackle the al-Qaeda-linked Islamist group, al-Shabab. The UN has imposed sanctions on Eritrea, accusing it of backing al-Shabab - charges it denies. "The people and government of Eritrea shall not entertain, and will not be entrapped by, such deceitful ploys," a foreign ministry statement said. It said the attack was mean to divert attention from Ethiopia's "illegal occupation" of Eritrean territory, as well as its internal problems. Eritrea accuses Ethiopia of refusing to withdraw from the village of Badme, where the border war began, despite The Hague-based Boundary Commission 2002 ruling that it belonged to Eritrea. A number of people were killed and others captured when three camps were attacked up to 18km (11 miles) inside Eritrean territory, an Ethiopian defence official said. Mr Ali said Eritrea would raise the matter with the "appropriate diplomatic channels", such as the UN. He also dismissed as "ridiculous" the accusation that Eritrea was harbouring Ethiopian rebels. In recent weeks Addis Ababa has accused Eritrea of backing the groups who staged a January raid in the northern Afar region, killing five Western tourists. Two German nationals were taken hostage during that attack - there has been no official word of their condition since. He said Eritrea was harbouring "hit-and-run terrorists", and he warned of further possible operations. Eritrea was annexed by Ethiopia in 1952 but gained independence in 1993 after a 30-year guerrilla war.